So during the infamous wedding season of 2003 (which really wasn't over when I thought it was), I mentioned that my cousin & her now-husband won an HP contest for a whole bunch of cool HP toys for their wedding. I (or part of me, anyway) am in three of those photos. Isn't it just my luck that a picture of me to be seen by thousands and thosands of people features me in my PJs and pigtails? And there's no kind of context to show why the heck we are all there in our PJs. I just look like a ridiculous cartoon character. Here is a shot where you can see my socks, my PJs and my hands. It is a precursor to my debut as a hand model (next shot). I am quite proud of my hand in this shot. See how steady I held the little name card? It is my debut as a hand model... the first step in a lucrative new career. 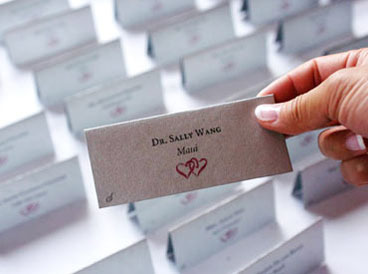 And I don't know who "Dr. Sally" is except that I don't think she ever showed up to the wedding, which is why I was holding the card for the shot. Rawr, your hand is HAWT! I think more gals out there need to post in their PJs with pigtails. That pic is just too cute! I'll have to wait until I get home to look at the rest of the pics, though, damn it.